If there was ever going to be a Sports Betting Hall of Fame, there are a few pieces of memorabilia that would serve as the facility’s cornerstones. It would want a betting slip from when Donerail won the 1913 Kentucky Derby as a 91-to-1 underdog — the longest shot to win in the race’s history. Maybe organizers would throw in a seat from the Hilton, the whiteboards from the Stratosphere, or a mound of cigarette butts from just about any casino in town. The most famous item in sports betting history, as you might suspect, is located in Las Vegas. It’s not in a sportsbook, though. It’s tucked away on the 39th floor of the Planet Hollywood Resort & Casino. And even if you did end up grabbing it, you would need a DeLorean and Doc Brown to make much use of it. 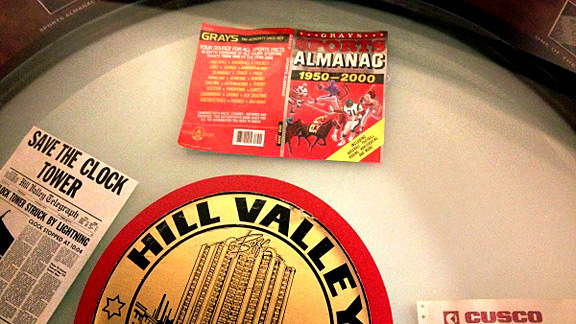 Grays Sports Almanac, of Back to the Future fame, sits trapped inside a coffee table and alongside other mementos in Planet Hollywood’s Back to the Future suite. (The movie had several copies of the almanac as props, obviously, and one of those resides here. Marty McFly burnt the real one!) As the dustcover notes, the almanac famously offers the results of every sporting event in competitions as far-reaching as polo, Ping-Pong, and slamball from 1950 through 2000. Every sports bettor and bookmaker has dreamt about obtaining such a notebook, and I’m pretty sure the boss would change the name of this site to Kobe-Magic-Jabbar-land.com if he could hang this almanac up in his home. The holy grail of sports betting isn’t the only prop behind reinforced plastic and glass in the suite. The USA Today that announced the arrest of Martin McFly rests inside an adjacent table. 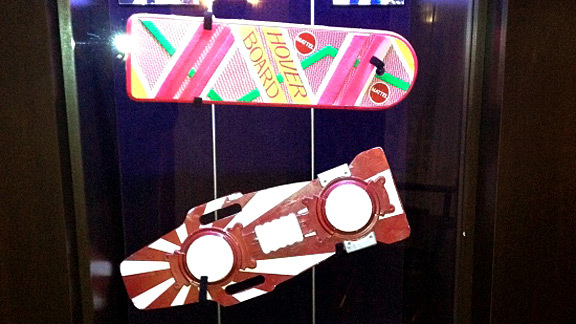 Hoverboards sit in a cabinet across from the room’s bar. Costumes are on display in the bedroom. The Back to the Future suite is one of 64 themed Panorama suites inside Planet Hollywood, formerly The Aladdin. Every room at hotel has a piece of movie memorabilia, but only those suites have a line of actual props from a particular film or set of movies. Other suites have themes related to the Rocky series, Star Wars, and even famous movie weddings. And unlike some of the more ridiculous and opulent hotel rooms in Vegas, you can actually stay in this suite without dropping an average year’s salary at the tables. These 64 suites feature one master bedroom with a living room and 2.5 bathrooms, including an oversized Jacuzzi. You can’t book them in advance, but if you’re staying in a Planet Hollywood standard room, you can request them when you arrive and check in for an additional fee of $300 per night. You can add an adjoining room with 500 additional square feet and a second bedroom for another $100 per night. If you’re staying at Planet Hollywood, you might also want to check out its sportsbook, which is located in the rear of the casino, near the Miracle Mile shops. That’s a blessing and a curse. If you’re heading to Vegas with people who really have no interest in sports, the location makes this book a great place to part ways for a period of time, since the non-sports fans can go gamble or shop while you indulge yourself in the PH book’s 32 televisions. The downside is that the book opens out into the mall, so it is constantly flooded with noise. A PBR Rock Bar restaurant is located directly across from the sportsbook in the mall, and it has all the noise and charm you would expect from a bull-riding-themed bar in the middle of Vegas. In all fairness, the Rock Bar is a relatively cheap place to eat in the center of the strip, and an even better one — Earl of Sandwich — sits within 40 yards of the book. This is a great book to sit in if you’re hungry. On the other hand, we sat down for a Monday-night game and didn’t see a single cocktail waitress come by; if you wanted a beer, you had to head to the bar at the back of the book. The book itself is not particularly big; it’s got a low ceiling, and there are about 65 seats and a number of VIP areas scattered around. It’s a dwarf compared to the cavernous books in places such as Caesars Palace or The Mirage. There was only one betting window open before the Monday-night game started, and by the end of the first quarter, the seats were only about 60 percent filled. So if you’re in Vegas and staying in Planet Hollywood or just want a somewhat noisy, comfortable place to watch a game without having to show up hours in advance or bet hundreds of dollars to get a seat, PH might be a good book for you. If you’re looking for an otherworldly Vegas sports-watching experience, though, you’re better off going somewhere else. We’ve covered the concept of hedging a futures bet in the past, but it’s always nice to apply some science to bets you actually made. So let’s explain how we can lock up one bet against the Bears by betting on that very team. Before the season, I bet $100 that the Bears would win fewer than 8.5 games. (Before you get started on how lucky I am that the Bears will win this bet, I’ll cover this and the rest of our preseason futures after the season is over.) With 14 games in the books, Chicago has gone 7-7. That puts me in the unique spot of being able to hedge this bet while also making sure I see a decent profit. The Bears finish the season with road games against the Packers and Vikings, both difficult contests. But let’s do the math and figure out how to ensure a profit. Since the bet was placed at odds of -130, my profit on the bet if I win is $76.90. If the Bears go 2-0 to finish the season, though, I’ll lose the $100 I wagered. Using the log5 method and each team’s point differential, my estimate is that the Bears will actually win both of their remaining games just 12.4 percent of the time. They’ll beat the Packers 18.5 percent of the time, and they’ll get past the Vikings in 67.2 percent of match-ups. Considering that the point differential I’m using for Bears includes a half-season from injured quarterback Jay Cutler, 12.4 percent is almost surely an aggressive estimate. So 87.6 percent. of the time, I’ll see the Bears lose and win my futures bet as a result. If we ran these final two weeks a million times and used these probabilities, my expected return on the bet is $54.96. What if I want to ensure that I never lose, though? That’s where the hedge comes in. The Bears are enormous underdogs on the road at Green Bay on Sunday; currently, a moneyline bet on Chicago to win outright is up at the Las Vegas Hilton at +600 odds. Those are “real” odds of 14.3 percent, just below log5’s estimated 18.5 percent. With a line like that, I can place a small bet and return a monstrous profit if the Bears win outright. Even better, I can still win my futures bet if the Bears lose in Week 17! My dream scenario, in which the Bears beat the Packers to win my hedge bet and then lose to the Vikings to cover my futures bet, would net me a profit of $256.90. It happens only 6.1 percent of the time, but that’s enough to justify the hedge. When you throw in the fact that it locks in my profit and insulates me from any losses, it’s a bet that I simply have to make. You guys! The Chiefs beat the Packers last week at home. And the Raiders are way worse than the Packers! As a good rule, when you see moves that are clearly overreactions to the past week’s results like this, it’s usually a good idea to head in the other direction with your bets. Think about this for a second. The Redskins are 5-9. They beat the Giants last week, but that was their first win in four games and just their second in their 10 post-bye contests. They have absolutely nothing to play for, they’ve been worn down by suspensions and injuries, and they are starting Rex Grossman at quarterback. Considering all that, this line has somehow risen 3.5 points and might go from the key number of three to the key number of seven in a week’s worth of bets. What does that tell you about how bad the Vikings are? The hardest thing for a line to do during the week is move across three; that is to say, to go from 3.5 to 2.5. Since a disproportionate amount of NFL games end with a three-point margin of victory, a bettor who is ahead of the curve can bet on one team at +3.5 and then get the other team later on in the week at -2.5 and have a healthy chance at hitting the middle, winning both bets. Vegas wants to pay bets on only one side of the line, so bookmakers let the line cross three and hit 2.5 only when there is a dramatic amount of action on a side at +3.5 and then +3. The side taking all that action this week, of course, is the much-maligned Philadelphia Eagles. Since Michael Vick came back, the Eagles have handily beaten quality opponents in the Dolphins and Jets. That’s the team most everyone expected to show up in September. The heavy action on this line suggests that the public perceives the Eagles to be a superior team to the Cowboys, a team they beat by 27 points at the end of October. That may or may not be the case, but the sharp bettors who hit this line early don’t really care by now. Chances are that they just want the game to end with a two- or three-point win from the Cowboys. Everyone wants to hit their middle. Eds. note: This post has been updated to reflect the correct Chicago schedule.